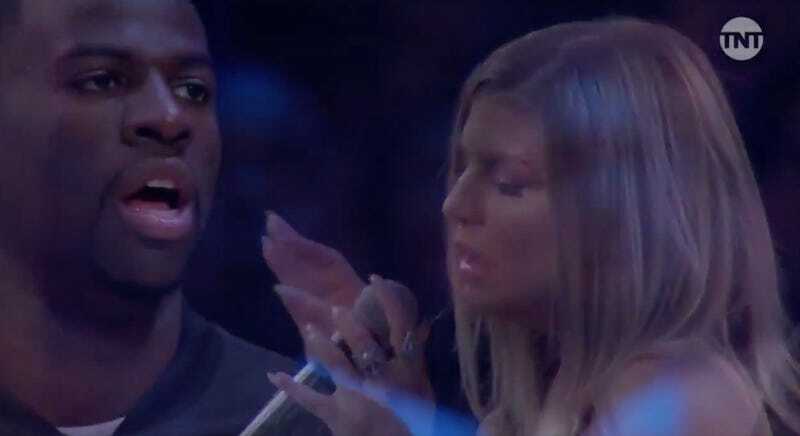 Before the start of the 2018 NBA All-Star game, Fergie uncorked a staggeringly bizarre rendition of what was supposedly the national anthem on an unsuspecting public. Like everyone else who heard it, Draymond Green had himself a chuckle, perhaps because he’d just witnessed a lady singing the word “wave” such that it contained 12 syllables and multiple octaves. Green initially claimed he was “chillin’” during the anthem, but Fergie’s ex-husband Josh Duhamel doesn’t buy it. In an interview with Kristine Leahy, Duhamel called for Green to apologize to Fergie, because that’s what a “real man” would do. He also called him Green a prick, which isn’t really that controversial an opinion in basketball circles, but seems worth noting all the same. Green’s an experienced beefer, but he’s never stepped to someone who has been nominated for a Daytime Emmy Award for Outstanding Supporting Actor in a Drama Series. Look out man.